After reading a fb post from the ITSAN support group, im so interested to try out garlic baths. Apparently they are the ultimate antibiotic or bacterial killers. THIS is the website which set me off the “alive” garlic chase. i finally dug out the garlic press again for the next round of experiments. I bought the bag of french garlic for about SGD5 dollars plus. Its SUPER expensive compared to china garlic which cost only about 2 dollars plus? And with more bulbs? To be honest, im not sure if i can tell the difference between the 2. Maybe tomorrow i will chop one side by side to compare the smell. I also bought a packet of 100 teabags from Daiso for sgd 2 dollars. 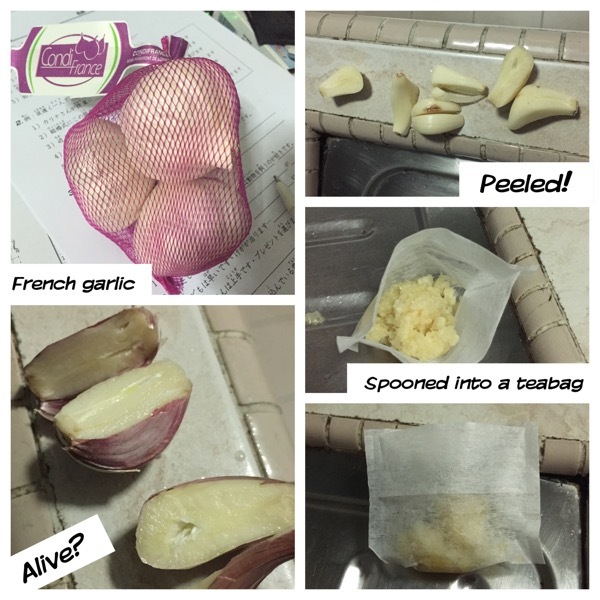 I peeled 3 cloves and pressed it with my shiny garlic press and spooned them into the teabag. Then left it for about 10mins and threw it into my pail of acv/epsom/tea tree oil leg soak. Junks: lactogg, olivenol, mungbean soup, oreos, lemon biscuits..
Why does my stomach always feel alittle weird upon eating a raw clove of garlic? 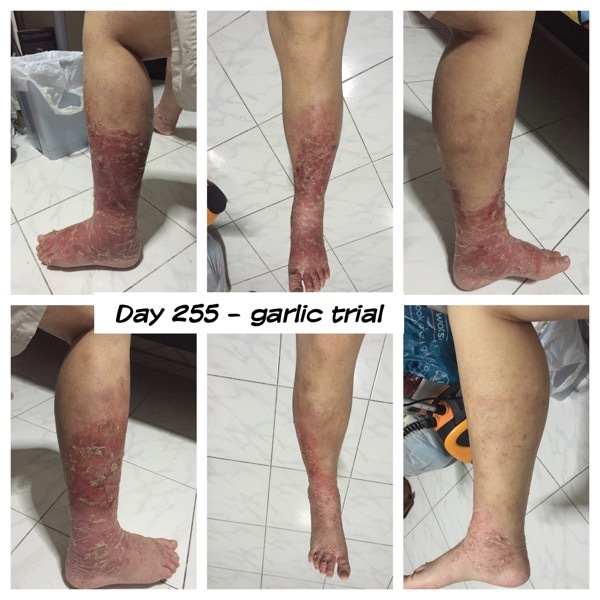 Is it me or my right leg is looking abit less red today after the garlic soak. Meh. Better not get my hopes up.